Theatre Workshop, the leading theater company/group of Kolakata, will be premiering their new production “Jadio Galpo” at the Academy of Fine Arts theater in Kolkata at 3.00pm on Saturday February 7th. The play is written by yours truly and was earlier produced by our group ECTA in Kolkata and USA as “Satyameva”. 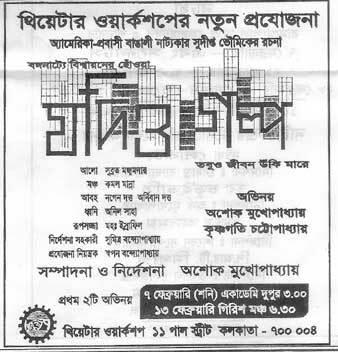 The play has also been published in the Bohurupi theater magazine in 2008. Theater Workshop, who under the leadership of Ashok Mukhopadhyay, is promoting the play as the first attempt in globalizing Bengali Theater. Globalization has affected Bengali theater from its early days with the contributions of Herasim Steppanovich Lebedeff and later with the numerous adaptations of western plays onto Bengali stage. But the play “Jadio Galpo” introduces globalization from a different perspective – it deals with the lives of the global Bengali. Bengalis are no longer limited within the geographic confines of the two Bengals, they have now spread themselves out all over the world. And, it is rare to see a play these days that talks about the lives of the Bengalis who live outside Bengal or Bangladesh. There has been some attempts in films (Bong Connection, The Namesake etc.) but Bengali theater has always kept themselves limited to their roots. In 2006, when our group staged “Ron” in Kolkata, it created quite a bit of stir. Ananda Lal, the theater reviewer of “The Telegraph” wrote in 2007 while writing about “Satyameva” – “The group from New Jersey who last year stunned Calcutta with their play Ron…”. And I believe that this effect was caused not by any production extravaganza, but due to the fact that possibly for the first time the Kolkata audience experienced a Bengali play that takes place in an American locale, a play that tells the stories of Bengalis in America. “Jadio Galpo” also tells the stories of two generations of Bengalis in America – the veterans who struggled hard to reach their pinnacle of success, and the new comers or FOBs (Fresh Off the Boat) who with their H1-B visa are set to conquer the world by any means. But it also talks about hopes and dreams – dreams fulfilled and dreams shattered. The tales of the global Bengali also needs to be told – also needs to be listened too. Because it is only from a distance can one see one’s own world in a different light. Other shows will be advertised in the local newspapers. The play is directed by Ashok Mukhopadhyay who also acts in one of the lead roles. The other character is performed by Krishnagoti Chatterjee. If you happen to be in Kolkata, I’d strongly encourage you to watch the play and give me your feedback. This entry was posted in Arts-Culture, Generic and tagged jadio galpo, Kolkata, Theatre workshop by sudipta. Bookmark the permalink.